Early Childhood Development is a priority area within the South African context and is supported by legislation, policies, guidelines and strategies nationally. It is mandatory for any person working with children in an ECD setting to have NQF level 4. This qualification will enable the recipients of this qualification to facilitate the all - round development of young children in a manner that is sensitive to culture and individual needs and enable them to provide quality early childhood development services for children in a variety of contexts. The GDF is committed to developing sustainable, empowered and prosperous communities through investing responsibly in all our beneficiary communities hence GDF took the responsibility of funding the ECD Practitioners for NQF level training project for Gamagara practitioners, as investing in education is a return on investment. This project is to ensure that practitioners are equipped with relevant knowledge and skills to provide quality learning to children between the ages of 0-5 years. The GDF wants the children in the Gamagara communities to receive quality ECD education and so they can be prepared for formal schooling. The NQF Level 4 will help the practitioners receive adequate support and assistance in order to integrate practise and theory, to provide practitioners with a formal education for continuity in the career path, to assist government in attending its first essential outcome-basic education and to also assist those who never had a chance to attend formal higher education in achieving such through this training program. The ECD Practitioners will be trained on NQF Level 4 and be equipped with the relevant knowledge and skills. The course will take nine months to complete and successful candidates will receive an NQF Level 4 certificate. The qualification will enable ECD practitioners to be sensitive to cultural and individual needs of all children in their classrooms. The project will not only help with the sustainable development of babies and young children, but also help protecting the rights of children. The Bursary Scheme was created to bring change into the lives of the Gamagara Students who have completed their matric and are qualified to enrol at a university or an FET College, and for high performing first year undergraduate. The Bursary Scheme ensures that student who cannot afford to go to tertiary are given the opportunity to get quality education. The initiative that was taken was to bring out the best out of their abilities. The Bursary Scheme caters for Tuition, Accommodation and Books in doing that we look at the worsen stage of the communities where they don’t have to worry about the situation but better results that will benefit the whole Gamagara Local Municipal area. Currently we have 8 students at various institutions. Deben Pre-Primary had one classroom for Grade R which accommodated 80 kids, and the Grade R practitioner informed that almost more than 60 children were are on the waiting list due to limited class capacity. The kids on the waiting list are deprived education because the alternative Grade R in Deben were the kids can be accommodated. GDF saw the need to construct an ECD Centre that will provide available learning for 80 kids from Deben in addition on the existing one classroom and also saw to take upon the need of provide nutritional meals for learners between the ages of 5 and7, from previously disadvantage communities through the nutritional scheme. The Grade R classes project was created to also assist kids within the area to comply with the requirements for Grade R and 1, as outlined in the policies of the Department of Education. GDF provided additional classrooms at a capacity of 80 children, learning materials, indoor and outdoor games. The outcomes that GDF is hoping to see is the improvement of the inclusive learning environment for all kids in Deben, provision of Education for all children in Deben, hence no child will be on the waiting list. The launch of the Grade R classes for Deben Pre-Primary School, occurred on 30 Friday 2013. Gamagara Development Forum (GDF) has proudly funded Gamagara High School with 12 classrooms; a media centre; enlargement of the kitchen and construction of ablution block, all to the value of R16.7 million, which is a contribution from Sishen Iron Ore Company- Community Development Trust (SIOC-cdt), the project was divided between building costs, equipment and furniture and consultation fees. Gamagara High School was launched in March 2013. Gamagara High School previously had 9 mobile classrooms build from asbestos and prefabricated materials. The total number of learners in the school was 500 and currently there is 585 learners since there has been an introduction of Mathematics and Physical Science. The project was most efficient as the budget used for what was intended for. 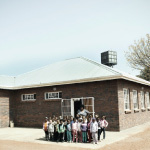 This project is aligned to the GDF’s focus area of Education and Development which puts emphasis to improving the educational conditions and outcomes of the learners from within the community of Deben and its surrounding area, to ensure that our communities have adequate education and skills required by our economy and position the municipality on the competitive edge for economic diversification to create sustainable jobs for our people and businesses. GDF funded this project because the aim was to create a conductive learning environment where learning could be maximised, mobilise increased focus on education development and to ensure that Gamagara High School was in a good condition and which offered advanced learning facilities to its learners. The building of the school has a huge sustainability potential and will serve the community for many years. The teachers, learners and all the education stakeholders are content with the new infrastructure because it has positively improved the learning environment. GDF built this new structure to ensure a conductive/conducive learning environment and to bring about a positive impact on how the teachers and learners interact. Education development within the province requires integrated stakeholder relations to ensure improvement quality of education from Grade R – 12. Gamagara Development Forum (GDF) formed the Curriculum Learner and Teacher Support Programme to support the Department of Education in addressing the challenges facing the sector and improve the quality of learner output, to increase the number of Grade 12 learners who pass mathematics and physical science and to reduce the number of schools performing below 70%. The Northern Cape Province is one of the poor performing provinces in respect schools results. This is attributed to varying factors overcrowding in some classes, socio- economic conditions in the district, unemployment, lack of parental commitment, low levels of literacy within the community and a shortage of resources as stumbling blocks for learners. The programme build-up on the same project already funded by Kumba and Standard Bank for three schools with the municipality. GDF will rollout subjects and grades not covered by the existing donor, this project will be conducted after schools and weekends. The following subjects are covered; Mathematics, Natural Science, Economic & Management Science, Technology and English (First Additional Language). Gamagara Development Forum (GDF) has prioritized education as its top priority focus area. In this regard, the GDF has invested in the youth of Gamagara with the Internship Programme, which involves creating temporary work opportunities for unemployed youth graduates of Gamagara communities, using the Work-skills Development concept. A large proportion of the Gamagara Local Municipality population remain on the lower bracket of literacy and skills creating barriers for them to grab exciting opportunities to effectively participate in South Africa’s economy and earn a living. The Internship Programme is one of GDF’s initiatives to bridge the Gap between the growing economy and the large numbers of unskilled and unemployed people who have yet to fully enjoy the benefits of economic development. The Work-skills Development Programme (Internship Program) is designed specifically to provide training and skills development for those local youth. It builds on existing best-practise government programmes aimed at deepening their labour absorption opportunities or extending them once they leave the programme. The reason GDF created this programme was to provide promising individuals with the necessary tools and experience required to adequately prepare them for the work environment within their different interest of careers and to acquire skills through a work-skills Development programme. Currently there are 8 interns doing their internship program with GDF; Delicia Cloete - Finance Intern, Meagan Julius - Welfare and Humanitarian and Healthcare Intern, Lorato Magida - PA Intern, Monei Tonyane-Monchwe - Safety intern, Mpho Matotong - Project Administrator (SMME Development) Intern, Odette Hantise - Reception Intern, Omphile Malgas - Stakeholder Relations and Communications Intern and Phemelo Phakedi - Infrastructure and Land and Housing Intern.